If you have a furnace, hot water tank, gas oven, or other fuel burning appliances then it should be important to you to hire an HVAC Professional who understands exactly how these combustion devices operate. 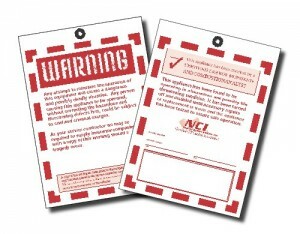 You and your family’s safety are at risk if these items are not installed correctly or adjusted occasionally to provide maximum efficiency and minimum exposure to Carbon Monoxide (CO). Testing appliances for CO safety and combustion analysis tuning is something most heating and plumbing professionals may have not been properly trained to do. The probability is that most professionals will install a new furnace or hot water heater and rarely do any combustion safety and efficiency analysis. Most rely on factory settings that rarely provide maximum efficiency and definitely do not guarantee safety. Carbon Monoxide testing is a vital process that should be performed on every fuel-burning appliance in your home, yet very few HVAC professionals have the knowledge to do these tests properly. Sadly it is not a requirement of the industry or even the building codes to mandate such testing. 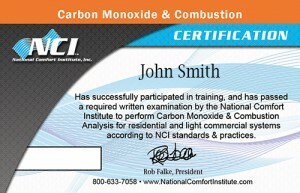 Therefore, one way to ensure you get the most skilled technician who understands the risks of Carbon Monoxide and maximum appliance efficiency, is to ask if they are a “Certified – CO/Combustion Analyst” by the National Comfort Institute. NCI-Certified Professionals have received the highest level of training on the hazards of CO and how to test for them and the means to prevent them in the future. Each NCI-Certified Professional has complete training on proper procedures for venting, combustion air, and fuel adjustment. This training enables them to maximize the efficiency of your fuel-burning appliances and, very importantly, verify everything works safely together. This also means the life of your equipment should be extended because of less wear and tear. National Comfort Institute has taken over 30 years of field testing experience and developed proper protocols for evaluating total equipment operation. Then, through comprehensive training, NCI-Certified Professionals receive the knowledge and skills to detect problems and make the necessary adjustments and repairs. All NCI-Certified Professionals must pass a written exam after completing training; Graduates are awarded a two-year Certification that identifies them as someone possessing the most advance knowledge to service your equipment. As a consumer, hiring an NCI-Certified Professional should provide you with added confidence that you have secured the services of the most skilled professional in the HVAC industry.